Back in 1968, Elyse released her self-titled debut record. She had quite a buzz back then ap pearing on The Tonight Show, in Newsweek among other things. All big deal stuff. Jump ahead to 1999. That's the year Andrew Rieger of Elf Power discovered and fell in love with the long forgotten album. He contacted Elyse, who now goes by the name Cori Bishop, and the rest, as they say, is history. Orange Twin Records re-released her the self-titled Elyse and a couple of other songs recorded during that era. One of those songs, "Houses" even features Neil Young's guitar work. The record once again created a buzz and even inspired Dinosaur Jr. and others to cover her work. 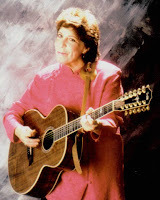 Over the past several years, Elyse has been doing shows and has recorded her first album since the late 60's. The record, In My Own Sweet Time, is slated to hit shelves November 15. The record is a blend of melodic folk, country and pop. Check out the first single, "Anybody Out There?," from In My Own Sweet time below. MP3 Grab: "Anybody Out There?"